Heritage sites are a significant part of our collective memory and we are losing them at an alarming rate. 3D laser scanning and other advanced technologies allow us to preserve and experience these incredible places in a way previously impossible. CyArk operates internationally as a non-profit organization with the mission of using new technologies to create a free, 3D library of the world's cultural heritage sites. 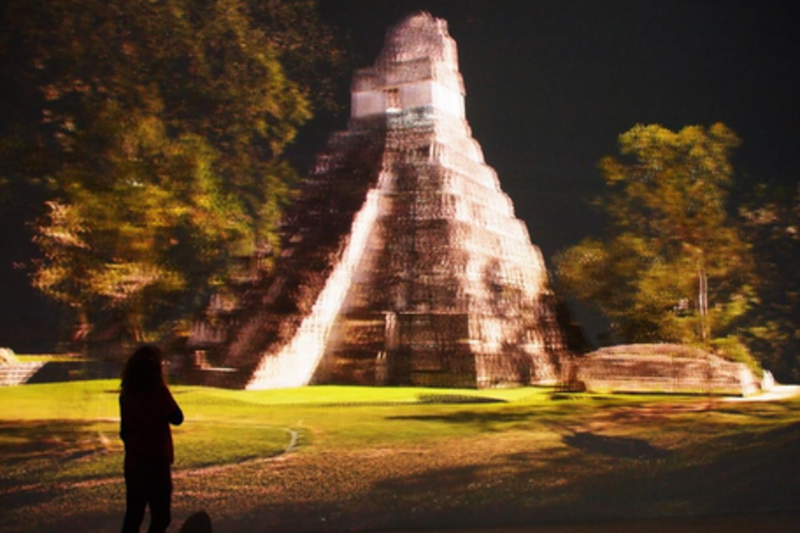 Deep Space 8K at the Ars Electronica now lets visitors see virtual reconstructions of historical sites in 3D and walk through them in the truest sense of the word. Together we are building the museum of the future. Aaron leads a next-gen agency's North America business. Part of the Weber Shandwick family of engagement brands, our mission is to Open Minds, to inspire people to think, act and do things differently. And that takes Open Minds. We never limit ourselves to one point of view. We're media, discipline and channel agnostic. We work with some of the world's most important brands, from Microsoft, Seagate and Tata Consultancy Services to Pizza Hut, AmorePacific and Kaiser Permanente. Aaron has an MBA in marketing from the University of Minnesota and is an adjunct instructor in the Masters of Business Communications program at the University of St. Thomas in Minneapolis where he teaches a course on how emerging technologies – from social to mobile to Big Data – are transforming the practice of corporate and marketing communications. Aaron also serves on the board of directors of the Citizens League of Minnesota. Austrian native he studied business administration at the University of Linz, Austria and Linnaeus University Växjö, Sweden, majoring in service management and international business. Still undergraduate he started to work in 2000 as Infotrainer at the Ars Electronica Center, including several stints abroad. Following graduation he spent three years as club manager at the Luftenberg Golf Club. Since August 2008, he has been back at Ars Electronica: first as assistant to the CFO and establishing the event services division; since January 1, 2011, manager of the Ars Electronica Center. In 2014/15 he was the project manager of the “Deep Space 8K” and is furthermore responsible for close collaboration with international science organisations like ESA – European Space Agency. Elizabeth Lee serves as Vice President for CyArk, an international non-profit organization with the mission to capture, archive and enable virtual access to the world’s cultural heritage. Her expertise includes developing international partnerships in support of technology driven solutions for cultural heritage protection, education, and tourism. Originally trained as an archaeologist with excavation experience in Turkey and Hungary, Elizabeth has been applying 3D reality capture technologies to the cultural field for over a decade. She has completed over 100 projects working with dozens of cultural ministries, the United Nationals Educational Cultural and Scientific Organization (UNESCO), and top technology companies including Microsoft, Autodesk, Seagate, and Iron Mountain. Elizabeth is a 2015 Winner in the SXSW Eco Place by Design competition. She is a member of the International Council on Monuments and Sites (ICOMOS) and a graduate of the University of California, Berkeley. Tim Bucher is currently senior vice president of Seagate's Consumer Group. Prior to joining Seagate, Tim was the founder and CEO of Lyve Minds, Inc., a technology startup in Silicon Valley focused on helping consumers manage their digital life memories. In the past 30 years, Tim has created several successful companies in consumer products, storage technology, cloud services, and IoT ecosystems and helped tech giants such as Apple, Microsoft, and Dell Apple drive consumer innovation and expand their businesses. He was the founder and CEO of ZING Systems, Mirra, Inc. (purchased by Seagate in 2005), and TastingRoom.com. Before starting ZING Systems, Tim served as Senior Vice President of Engineering at Apple Computer, where he oversaw the development of all Macintosh products and iPod technologies. He has also been vice president of Consumer Products for Microsoft and vice president of Engineering and Operations for WebTV Networks (acquired by Microsoft in 1997), where he led all TV and DVR product initiatives. Tim was part of the founding Xbox team at Microsoft and a lead architect with gaming systems pioneer The 3DO Company. He also worked as an engineering director at NeXT Computer (acquired by Apple) and lead engineer in the 80’s on several advanced workstations at Sun Microsystems (now part of Oracle). Tim holds numerous patents in networking technology, user interface design, computer and processor design, graphics technology, on-line customer acquisition algorithms, manufacturing processes, and multimedia technologies.